Fort San Pedro, located in Cebu City's wharf area, was the nucleus of the first Spanish settlement in the country. It began as a single triangular bastion, built in 1565, and was expanded and fortified over the next 200 years. 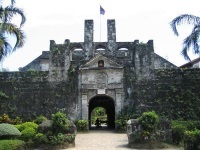 Over the centuries the fort has been put to several uses: it was a watch-tower used to counter pirate attacks in the 1700s; a prison for local rebels during the Philippine revolution; a US army barracks; and, during World War II, a prison camp. Today the fort has been turned into a museum park, giving visitors to Cebu a glimpse of the island's history. The fortress is actually very small and exploring it doesn't take long, but it is well-preserved and interesting and cultural events and shows are frequently held on the site for the amusement of tourists and locals. There are usually student guides available at the fort to show visitors around and they provide comprehensive historical background which greatly enriches the experience. The tours are free but tips are appreciated. Fort San Pedro is one of the most famous landmarks of the city and a visit is incomplete without a turn around the old fortress. The Cebu dock area is also interesting in itself and worth strolling around.